HeartShare is a recipient of a $128,000 grant from the NYC Council Autism Initiative. The U.S. Centers for Disease Control and Prevention announced in April 2018 that now 1 in 59 children are diagnosed on the spectrum each year. HeartShare is a recipient of a $128,000 grant through the NYC Council Autism Initiative, which helped open and sustain two critical programs for children with autism. The HeartShare School’s After School Program is one of them. Students have their routine during school hours—their classroom work combined with therapeutic sessions and lessons. The After School Program team supervises some recreation time and then, facilitates a group activity, typically focused on community giving and building vocational skills. “The After School program reinforces and expands what the children are learning during the school day. The program offers more time to learn, play and socialize in an environment that’s already comfortable to them and customized to their needs,” explained Sharon Toledo, Director of The HeartShare School. Through the After School Program, the children have formed a Kiwanis Club. Last year, the students made and sold custom ornaments during the holidays. They also collected toiletries and other items for veterans at the Brooklyn VA Hospital. “Through their Kiwanis chapter, our students raise funds for causes and others in the community, including other special needs students,” said Jodi Vitale, a Physical Education teacher who oversees the program and is a proud HeartShare First Step alum. In addition to their community service, the students formed an art club. “We are glad to have these additional outlets for expression and creativity,” said Toledo. An annual $128,000 grant from the New York City Council’s Autism Initiative helped open and sustain two critical programs, including the Holiday Respite Program for pre-school students and The HeartShare School’s After School Program, which helps students socialize, contribute to their local community and learn life skills like meal prep (pictured above). The NYC grant also supports HeartShare’s Pre-School Holiday Program, which operates in HeartShare’s Cuomo First Step Early Childhood Center in Richmond Hill, Queens. The program is available to parents during school holiday breaks. “This program is critical for working parents who can’t necessarily afford child care during school breaks and vacations,” explained Dianne Cattrano, Director of Cuomo First Step. 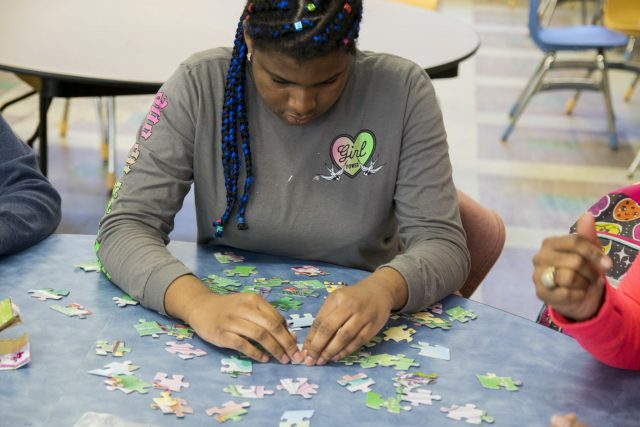 Funding from the NYC Council Autism Initiative broadly supports services for children with autism in after-school and summer programs and during school closings. The programs may also provide forums and training seminars to teach coping skills to families and caregivers affected by autism. “The grant has been critical to offering these programs to our children with autism, and their families,” said Linda Tempel, HeartShare Executive Director of Developmental Disabilities. Learn more about HeartShare’s Autism Services.